As this month comes to a close I thought it would be appropriate to look back on some of the larger or more unusual projects I have delivered over the past few months. Back in June I performed two role for the Beltane Annual Gathering. The first was consultation and project management for the design of the space, the second was delivering two training sessions and compeering part of the evening. This year’s annual gathering took place in Chesser House and welcomed those from universities working public engagement, educational organisations as well as those working in community practice. The theme was responding and reusing and as the site was a disused office building it was a fun challenge to convert long, sparse rooms into inviting spaces. A personal highlight for me was the U.V room which matched the overall neon outlined spaces in the rest of the building. The training sessions I delivered were on Snappy Storytelling and Thinking Creatively for Engagement Success. 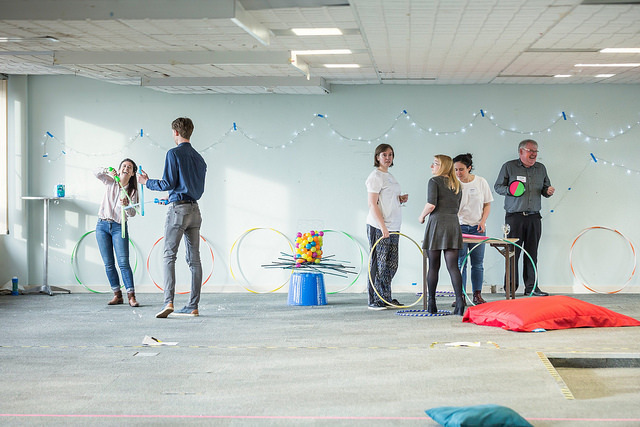 I really enjoyed working with a wide variety of people to explore how creative skills and imaginative facilitation can transform public engagement projects. Participants of the Snappy Storytelling workshop were also invited to deliver stand-up comedy style versions of their work, many of whom used their sock puppet partners to help deliver this. It is always a real pleasure to create an environment where people feel supported enough and enthused enough to share their work with a wider audience. July brought me back into focus with my theatre roots as Volunteer Coordinator for the National Festival of Youth Theatre in Ayr. Interviewing, training and supporting four young artists to develop over the festival and reflect on their practice was a huge highlight within the role. The festival itself was a storm of activity from the young performers, youth theatre tutors and invited artists to share a weekend of performance, workshops and social activities. I was also able to work with young performers at Whale Arts Centre, Wester Hailes to create a performance from scratch in three days. As the culmination of the project was to then see a production of At A Stretch at the Scottish Storytelling Centre I was keen to make a link between my work at that of director Caitlin Skinner’s. After speaking to Caitlin and receiving her full support I began to introduce physical theatre to a group of 5-10 year olds, some of whom were new to drama altogether. To say they rose to the challenge was an understatement. Although we learned that some moves were harder than others the resulting piece was one of my favourites I have been a part of this year. Using At A Stretch’s themes of non-verbal storytelling and connections between people the group at Whale created a strong sharing which was so good that after seeing the professional production one participant said ‘I liked it but they basically stole all of our ideas’. A beautiful misinterpretation of which show was created first but I was glad that my performers saw At A Stretch from the perspective of theatre-makers not just audience members. Other feedback included ‘That show was a little bit magic’ and I couldn’t agree more. August and September were both devoted mainly to creating the Curiosity Forest. Beginning with training sessions for researchers in storytelling and gamification as well as one-to-one sessions to help develop their work I was pleased to see the diversity of content created. I also delivered similar training for researchers at Napier University who were having their own Explorathon in Whale Arts Centre. The feedback from that event was brilliant and is a great example of Napier’s public engagement work. The Curiosity Forest was split into two events: an evening for adults including activities and story-telling versions of research and a family day of activities. I think the decorations this year were the best I have done, the only downside is now that I have my own house I have to store those mushrooms in my attic rather than leaving them at my parent’s house. Ah the unlikely downsides of homeownership. October has largely been about preparing for Christmas. As a true Halloween fan this has been unusual for me but a separate post will explain my plans for December. Smaller but still very exciting projects this month have taken me outside in the open air. Street Arts is now running in Broomhouse as well as Wester Hailes and so I got to make my Broomhouse debut which included creating mini performances with flying bikes and zombies. Ideal at this time of year. I also got to spread my performance wings a little again by convincing the general public visiting the haunted forest in Kelburn to enter the haunted house. The event itself was a massive success and was really well planned out. Walking through winding paths, through buildings and being scared at every possible opportunity – it really was brilliant fun to be part of the team for a few days. I have purposely left out my largest project this summer Small Stories for the Institute of Physics which has its own dedicated post here. For more information about my plans for December check out this post, clue it includes two castles and one Santa Claus.